We all love our mobile phones. Whether we spend time checking our phones for the latest social media updates, or messaging our friends on Facebook Messenger, WhatsApp or WeChat, or checking our emails, there are endless things that you can do with your mobile phones. 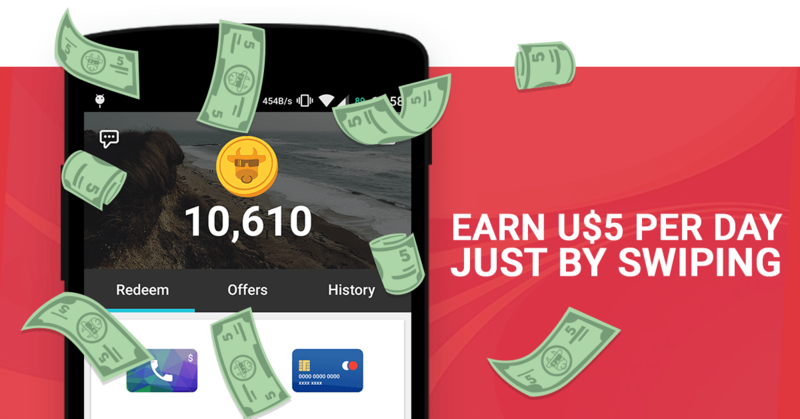 Now there’s another reason to love your mobile phone even more: earn cash. MooCash is a mobile lock screen app that rewards its users for downloading and trying out new mobile apps as well as watching short videos. The app is available on Android via the Google Play Store and for iPhone users, you can use it via their Facebook Messenger. The lockscreen app is a simple app that will display the latest offer. Simply swipe the screen to the left to claim the offer, and it will take you to Google Play Store to download the latest app on offer. An offer varies anywhere between 50 coins to 800+coins for downloading an app. You could also claim an offer for watching a short video, which is normally a short commercial on the latest mobile game. If you love playing mobile games or love online shopping, you simply have to try using this MooCash app. MooCash offers regular Clash Royale tournaments for those who love to play the game. So if you want free Clash Royale gemstones, that is an app to have. It’s also a great app to have simply because it gives you free money for trying out new apps. While it won’t make you rich or enable you to quit your day job, it is enough to pay for some small online shopping. Offers are based on MooCash coins, and approximately 2,000 coins are equivalent to $2. You can cash out as soon as you reach a minimum of 2,000 coins via Paypal. There are also other options for you to redeem your coins, such as via Google Rewards Card or Starbucks Rewards Card. You could also earn coins and make money for referring friends and followers to install the MooCash app. No, it’s really not a scam. This is a legitimate app with many users have posted their reviews on Google Play Store. Try it out for yourself so you too can earn additional free money. Previous ArticleUniversal Accounting Software – Do They Do Exactly What They Advertise?